Happy new years! Let the 2019 adventure begin! Home > Posts Tagged "VW Crafter"
2018 was our first year in business. It was an adventure! It was hectic and it was lots of fun. We spent the year building our very first van, building our website and the basic structure of our small company. 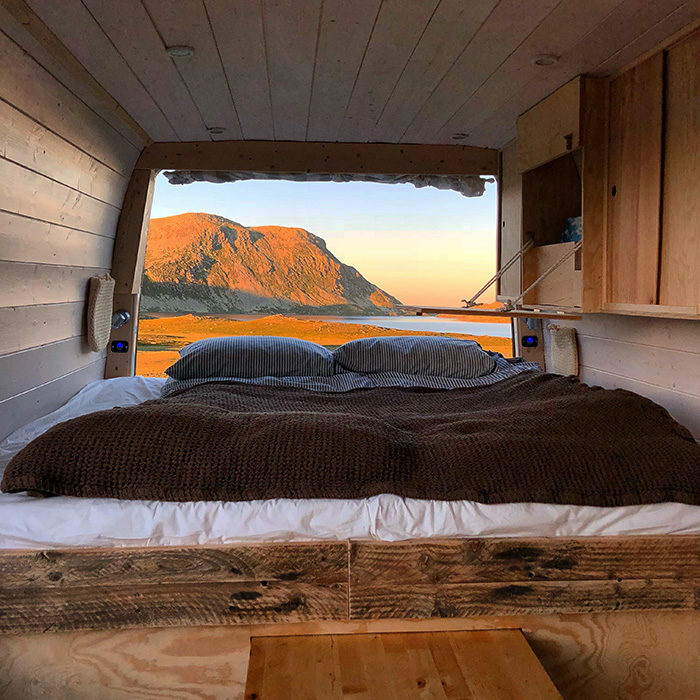 After launching, our first van was fully booked quite quickly, and we decided to add two more campervans during the summer of 2018. We had more than 200 rental-days with guests from 18 countries different countries, including Switzerland, France, Austria, New Zealand, USA, Netherlands, Spain and more. We were near fully booked from July (we launched in late May) until November 1st. From out 2018 pilot-year we learned a lot, and we were inspired to do more. For 2019 we are adding 5 new campervans, all VW Crafter, and built with a similar style and design, inspired by Norwegian cottages. All the five vans will have the same layout and features, but with some differences in design details, colors etc. The new vans are mostly 2014-2015 models driven around 40-70.000km. The conversion from VW crafter vans to Cabin Campervans will be done in our temporary production facility in Stavanger between January and March. We have also decided to only offer campervan rentals from Oslo. In 2018 we offered rentals from Stavanger and Oslo, and moved the vans between these cities to accommodate the different bookings. This was at times quite challenging and costly. Perhaps when we add even more vans we will start offering rentals from Stavanger and Oslo (and other locations), but for 2019 our vans will be placed in Oslo and can be picked-up and dropped off from there. For a few early-bookers, who booked from Stavanger, we will of course have your van ready for pick-up in Stavanger on your date! For 2018 we kept rentals going for November and December as well. October was very busy, and although the summer was over, it was still a great month for traveling around Norway in a campervan. For November and December we had fewer guests and our guests (and our campervans) had a few more challenges associated with winter traveling. In the winter season from November-March the minus degrees can for example lead to frozen water in the van or closed roads that limit travel. Because of these and other challenges we have decided to become a seasonal business, opening our doors in April and closing in November. Lots of travel businesses in Norway operate the same way. If you are one of those people who really wanna travel Norway in the off-season, you can still contact us and request a booking, and we can see what we can offer! 2018 was a great year for us and our campervan rental company. We loved the expressions on guests faces when seeing their van for the first time, and we were super happy with the feedback that we got when they returned. We are very excited about a new year with many new vans, and we are very much looking forward to summer!